In the USA and Canada a subcarrier called SCA (Subsidary Communications Authority) is used to add additional services to a broadcast FM signal. Some examples of the extra services provided are live financial stock telemetry, audio books for the blind, specialized audio radio programs for doctors etc and background music for supermarkets and stores. These SCA signals are modulated into standard broadcast FM radio signals, but require a special radio to receive them. Subcarrier signals can easily be spotted in the audio/baseband waterfall and spectrum plots available in most SDR software. Over on the new RTL-SDR DX blog, the author (Jay Moore) has uploaded an article showing how to use an RTL-SDR dongle to listen to audio SCA signals. The process involves using HDSDR to receive the broadcast FM signal, then using Virtual Audio Cable to pipe the audio into SDR#, where it is then possible to tune to the audio SCA signal. The same process could also be used to receive different subcarriers used in other countries such as Finland where a subcarrier is used to transmit DARC encoded bus stop sign telemetry. This article was about as useful as mammory glands on a wild boar hog… The “uploaded article” that tells how has been dead for at least a month! It might be interesting to note the microsoft spot watch, now defunct, an early attempt at a kind of smart watch received data via FM subcarrier. US broadcasters are allowed 1/2 modulation used in subcarriers to be recovered in the main, so if your RDS/57khz sub is injected at 7% (a typical level) you could increase your main mod 3.5% to compensate.. of if your occupied bandwidth is 75khz, you’d now feel comfy about using 77.25 khz. in reality, very few people were that tightly controlled. Currently, HD/iboc makes it a mute point. Look for subs at multiples of the 19khz stereo pilot tone.. 38(stereo),57khz(rds),76..
SCA’s were used a lot from the 1960’s to about 2000. Muzak was a huge user in many markets. An FM station with a strong signal could get an extra $500 a month in revenue. The only downside to an SCA carrier is that the SCA carrier’s modulation MUST be calculated in the FM station’s 100 percent modulation limit. In the days of modulation wars, program directors did not want to give any loudness away. So the GM had to overrule them. In the 1980’s there some stock market ticker transmission services on SCA. And there were a couple of nation wide pager services on FM SCA carriers. However by about 2000 much better methods of transmission were available for these services. And most SCA signals have gone away. Interesting historical footnote. In California there was/is an FM station licensed to a small rural community. This community is near a major market, it is simply separated by a mountain range. The station had programmed to the rural community for year. But as time went by and station values grew, the station sold and programming was flipped for the major market. But the new owners did an SCA lease agreement with the small rural town. The tiny town of a few thousand people purchased lots of SCA radios, and the town still had a small radio station serve the local area. are the carriers at 67khz above & below or just above? I try it with 2 SDR# Application but i cant see the Subcarier at 19k. What do i wrong or does i have tu use HDSDR? You can use SDR# if you can change minsamplerate in the config to allow you to open the NFM IF to at least 150khz. 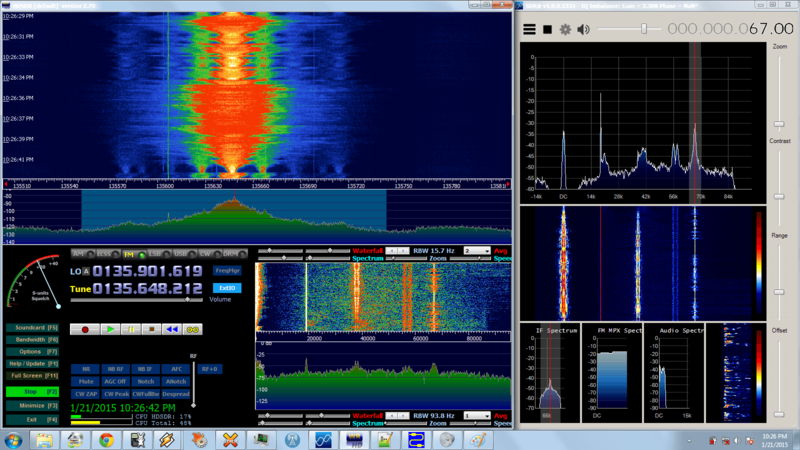 You need to feed the FM Baseband in to the second copy of SDR#. If you don’t see the 19khz subcarrier; you are likely in WFM mode, which feeds filtered audio. What kind of value i have to edit in the config file?